The spectacular and colorful Sanctuary, “il Santuario della Madonna del Tindari,” was built in the 20th century to accommodate the flow of pilgrims coming to see the iconic statue of Tindari’s “Madonna Bruna” or Black Madonna. 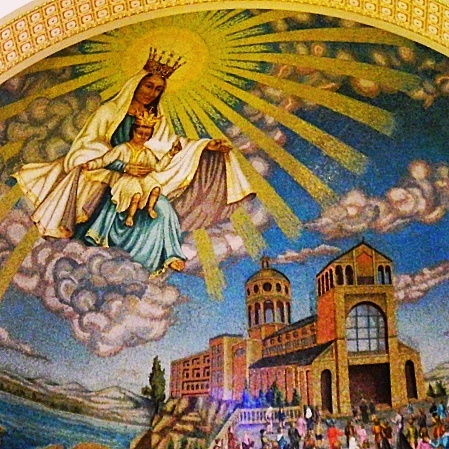 This mural is from the dome above the church’s main altar. September 8 is the feast day in honor of the Black Madonna of Tindari. Stunning work of art. I wonder if there was one artist or many. I think also Dana, that it’s a mosaic tile mural. I would venture to guess there was a team who worked on it. Next September, I hope to be there with a group for the feast… so we’ll have to find out then!